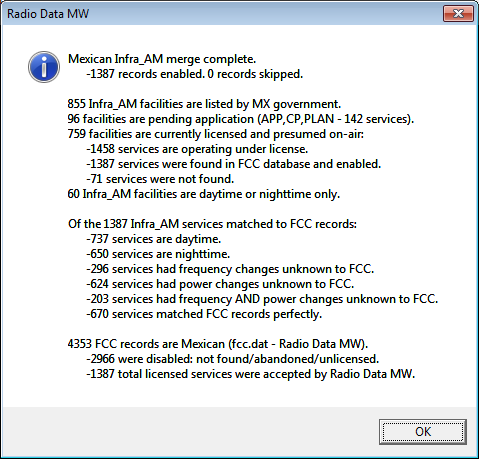 After reporting on the publication of the updated Mexican AM List by Mexico's Federal Telecommunications Commission the other day, I decided to plug their current station list into my Radio Data MW program and compare it to what the FCC thinks is on the air in 'ole Mexico. The results were alarming. The accuracy of the FCC's foreign data is even worse than I thought, though not entirely their fault. The FCC obviously maintains very accurate data for US stations, however data for Mexico is in serious question. One can assume (at least I can, from previous experience) that Canada, Cuba, and other foreign countries throughout Central and Latin America are lacking as well. By international telecommunications agreement, treaty or otherwise, border nations and others in the nearby broadcasting sphere are required to file with each other's telecommunications commissions in order to keep the resulting RF collision between countries at a minimum. From the results tallied, it seems not much inter-communication is going on. Let's have a look. A little file gyration was necessary to put the released Mexican data (file name Infra_AM, in .PDF form) into a textual format so it could be read, analyzed, and compared by Radio Data MW. Unfortunately, the Mexican data does not include transmitter geo-coordinates, facility IDs, or engineering information like the FCC maintains, so pairing the records at the outset seemed to be a problem. Call signs can be compared, however, as these almost always remain the same, and stations do not generally move about the landscape more than a mile or two before a new facility ID and call is mandated. One simple method to grab text from a .PDF file is to load it into Adobe Reader and select it, then paste the selected text into a text editor. Unfortunately, this method often leaves a lot of unnecessary line breaks which must then be removed. A better method is to e-mail the .PDF file to your GMail account, open it, then view it as an .HTML file. At that point, select the screen text again, copy it, then paste this into a text editor. The end formatting is a bit better with not so many false line breaks to contend with. After a bit more tweaking, I wrote a little extra code into Radio Data MW to handle the new file and merge its data with the FCC's. Sending Radio Data MW off to pair the records by call sign, it then compared frequency of operation, daytime and nighttime powers, and tallied what services each station did broadcast. Annotations were made to the resulting records, and the output tabulated and printed. I have provided a link to the list (find it below) for all interested. Perhaps it will help in your mediumwave DXing. Now on to the results. But before I get ahead of myself, let me define station "records" and station "facilities", and explain the difference between the two. It will be important in understanding the data. A station "facility" refers to the singular station itself. A station facility generally has several station records. A station "record" is a single data record usually applying to one of a station's particular "services". This record is a result of a station's application to the FCC for commencement of services. A station service can be defined as a "Daytime" service, "Nighttime" service, "Critical Hours" service, or "Unlimited" service. If, for example, a station has both a daytime and nighttime service, at least two records are maintained in some database, somewhere, one for each service. Separate records are a must due to probable differences in daytime/nighttime power, towers used, pattern, etc. Stations must also file for such things as applications for licensing, construction permits, frequency changes, power changes, and other modifications. 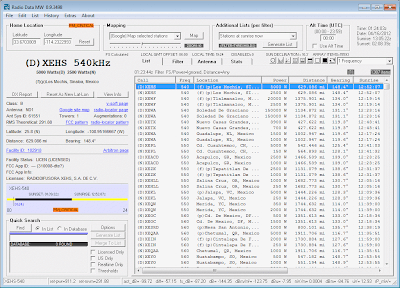 The FCC's AM database is huge. 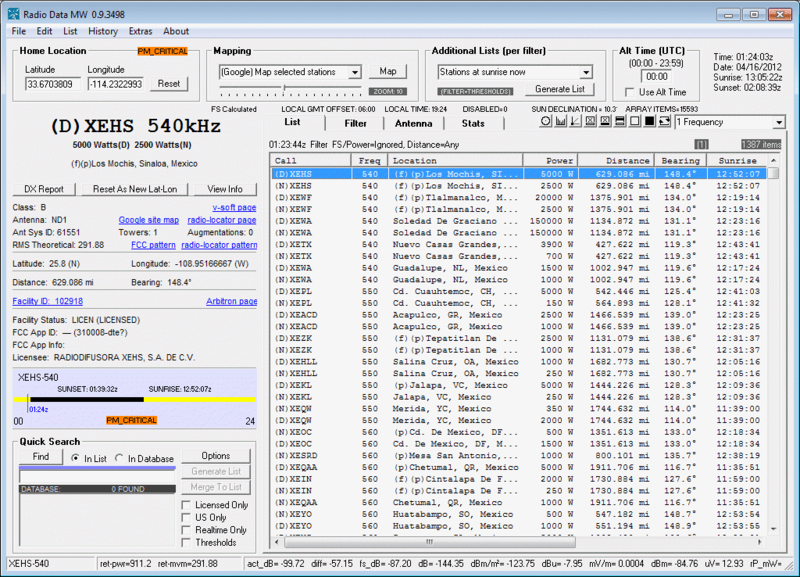 Some 25,290 station records are warehoused as of this date, attempting to cover virtually all of North America, most of Central America, South America, and the Caribbean. Mexican records number 4355, not all current - and none have ever been archived when outdated. Sorting through this quagmire is not easy. 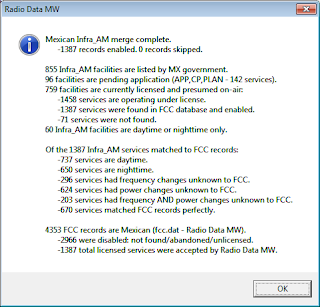 A scan of Mexico's Infra_AM file by Radio Data MW shows 855 station facilities. 759 station facilities hold licenses to broadcast and 96 are applications for license or construction permits. 1458 services, day and night, are operating under license, by their claim. AM radio is alive and well in 'ole Mexico. Of the 1458 services actually operating under license, 1387 were found and matched in the FCC database. 71 were not found. Are they actually on the air? According to Mexico's Federal Telecommunications Commission they are. There is no evidence of them in the FCC's database. Out of the FCC's 4355 Mexican records, nearly 3000 are impertinent - outdated data, abandoned operations, unlicensed. Many of these could and should be archived. An incredible 296 Mexican station services have changed frequency, unknown to the FCC database. 624 Mexican station services have changed power, generally upwards. Again, unknown to the FCC. 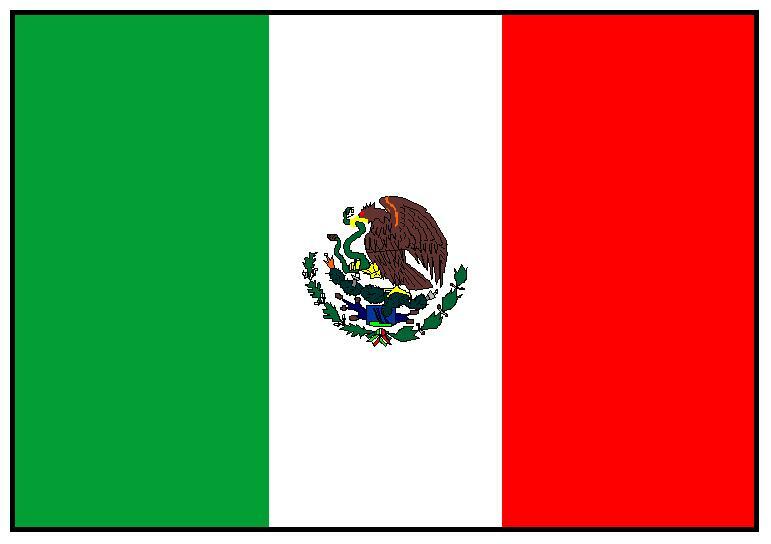 203 Mexican station services have changed both frequency and power, unknown to the FCC. 670 Mexican station services are in full agreement with FCC records: power, frequency, and service hours. Part of the problem is once a foreign commission files for station application to the FCC, often that's the end of the communication. Power changes may ensue, and even frequency changes. Additionally, the FCC does not maintain any official "status" of each foreign record - meaning - is it an application, construction permit, or license to broadcast? All 4355 records are lumped under the symbol: "-". Unknown!!! The best we can do under the current situation is accept the newest application ID number as the most current information and hope for the best. I have created a list of the current licensed Mexican data in .HTML form which will display nicely on your computer. A .CSV type file is also included which may be read into a spreadsheet form. The list contains only licensed stations which have been matched to FCC records, with changes. Nothing in this list has been verified on the air. It should make for some interesting reading.